NOTE: We have reduced our rates across the board in anticipation of projected construction north of Maui Kamaole and 40 feet below the hill upon which MK is built. There may be some noise M-F, 8 am-4pm. View is unobstructed. A step above, Maui Kamaole is Wailea quality at South Kihei prices. Walk to Kam III and Keawakapu beaches. Wailea (5 minutes). Lahaina (45 minutes). OGG (25 minutes). We sleep 2 Adults. We *may* accept 1 or 2 Children. Maybe you've endured some small, tired, marginally clean rentals in Hawaii. Not here! Maui Kamaole I-115 is our personal winter home. We want "Clean and Comfortable", and we want the same for you. This must work because happy guests keep coming back! 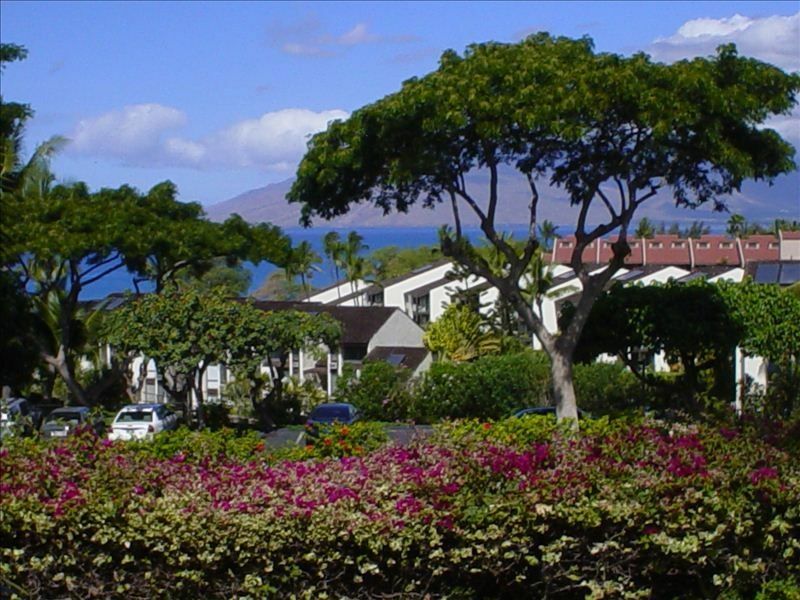 We chose Maui Kamaole for its peaceful beauty and amenities -- low-rise buildings and rare low density -- only 316 condos on 23 lavishly landscaped acres. Two *heated* pools, one with a waterfall. Hot tub. Jacuzzi. We chose this unit for its open plan, view, and its quiet location within the complex. We're steps from each pool, yet shielded from all pool noise. Their full staff is on call for you 24/7. The front desk at Maui Kamaole is open daily. The property has private security. I-115 is dramatically tiled throughout. The home-size kitchen has quality appliances, including a full-size refrigerator-freezer with ice-maker and filtered water -- no need to buy bottled water. There's great air flow through jalousie windows in bedroom and living room. Sliders have night locks. It's up to you to choose a breeze, use the ceiling fans, or switch on clean and whisper-quiet Mitsubishi split-system air conditioning -- separate zones for LR and BR. The bedroom is 200 sq. ft. with King bed -- new mattress 2018. Watch the sun rise over Haleakala from the tree-shaded bedroom courtyard. Modern window treatments with blackout in the bedroom. HD Cable TV and a smart Blu-ray for streaming or DVD's. Fast Broadband wireless. Full-size washer/dryer. Beach towels, chairs, umbrella, cooler. Assigned parking right outside your door. When you enter you will find a WELCOME with information about the condo, the complex, and an invitation to contact us or our Kihei agency with any questions. This is a smoke-free, state-licensed vacation rental. State of Hawaii License #TA-003-522-7648-01. Leo and I and I had vacationed in Hawaii for 20 years, enjoying two to four weeks a year on each of the four major islands. We rented at Maui Kamaole one winter and bought I-115 six months later. We chose South Kihei to be near the Kamaole and Keawakapu beaches and only five minutes from Maui's most deluxe hotels along the beautiful Wailea beaches. We chose Maui Kamaole for its larger condos, newer construction, and close ocean views. The intimate and uncrowded low-rise buildings are carefully positioned for privacy. We chose I-115 for that privacy and its cool, NW-facing lanai. We visit annually and are continually updating. When we turn off Kihei Road and start up the drive into Maui Kamaole we leave the busy world behind. It's all 'out there' -- shops, restaurants, beaches, activities -- but this is HOME. The complex is quiet. The entire property is beautifully kept and continually improved by an engaged, active condo board. Master bath has separate tub/shower and toilet room, with vanity sink in dressing area. Hall bath has vanity, toilet, and shower with powerful Speakman shower head. Plenty of HOT water. Whisper quiet Mitsubishi split system air conditioning with separate remote controls in BR and LR. Free assigned parking space immediately outside unit. Quality Bath, Hand and Wash towels. Beach towels. Free Broadband Wireless in unit. Drip coffee maker, filters. Coffee grinder. Interior table and 4 chairs. Lanai table and 4 chairs. 32" Samsung Flat Screen HD. In-unit paperbacks. Complex has free book selection at lower pool. Twenty-three acres of lush landscaping. Mature shade and flowering trees. Rentals in many locations near the condo. Snorkeling and fishing excursions launch immediately across from complex. Whale watching in season. Rentals at many locations near condo. Many courses only minutes away. Two HEATED pools, one with waterfall and jacuzzi, and one with hot tub (adults only). Mitsubishi split-system air conditioning. 32" Samsung TV, Wireless Broadband Internet, i-Home Radio/Charger, Cordless Phone w/Answer System, Ceiling Fans, Iron, Ironing Board, Hairdryers, Beach Equipment, Personal Safe, Sliders have night locks, Property has Two Heated Pools, Jacuzzi, Hot Tub, Tennis Courts, Front Desk. Night Security. Walk to Life-Guarded Beach Park & Small Boat Launch. Full-service maintenance on call 24/7. Entire property is treated by exterminators quarterly. Upscale Shopping, Maui Ocean Center Aquarium, WHALE watching in season. Snorkeling and fishing boats from Kihei Small Boat Launch opposite Maui Kamaole. Casual and fine dining in South Kihei and Wailea.